Insulated overhead industrial doors are incredibly hard wearing and very secure. They come in many different profiles and an infinite supply of colours. 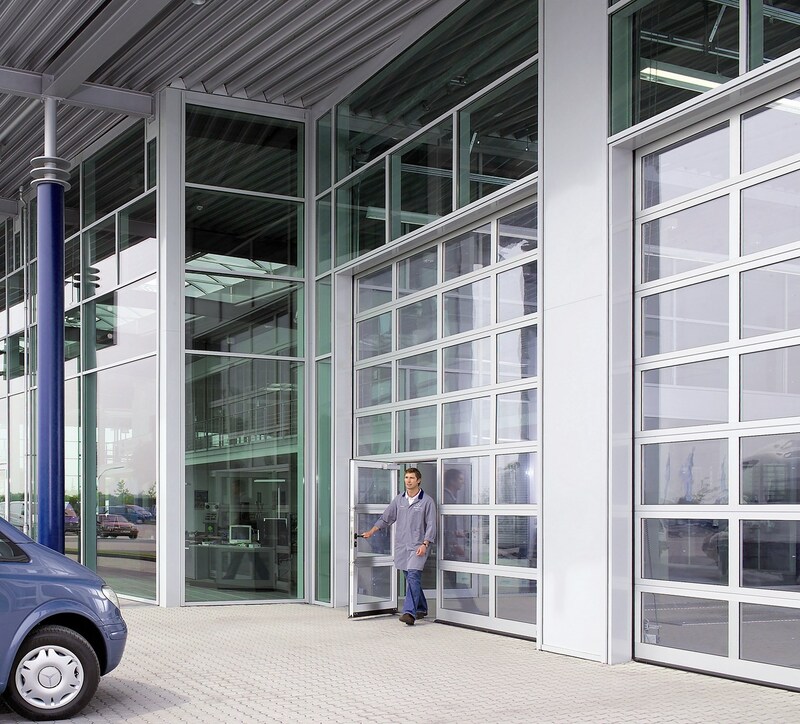 Insulated doors panels are constructed from 0.7mm or 0.5mm galvanised steel sheets, bonded together with CFC free polyurethane foam with integral thermal breaks, to provide a U value of 0.45w/m2oc. The combined effect of the panel insulation properties together with the effect of the thermal bridges at the panel-to-panel joints, result in an overall U value of 0.60w/m2oc. This value exceeds building regulation requirements. Standard finish – White polyester stucco both sides. Each panel is fitted with galvanised punched end caps, to accept adjustable roller hinges and carriers. The rollers generally have a steel shaft, nylon running surface and a ball bearing. Calculated specifically to suit the weight of each door, springs are fitted to a (most common) 1″ solid steel shaft and secured into the opening structure via bearing plates. The number of springs and plates depends on the size of the door. The ends of the shafts accommodate the cable drums, which the lifting cables wrap around, thus pulling the door into the ‘open’ position. Each door panel is connected to its adjoining panel by means of side roller carriers and intermediate hinges at approximate 1000mm Centres. Cold rolled 2mm thick galvanised steel track with bends which are pre-formed in pairs to ensure smooth operation. The tracks are secured in the opening structure by vertical support angles and from the roof by hanging supporting angles. Spring buffers are applied to the back tracks to ensure operating cables are always correctly tensioned.